2016 Audi A6 / S6 Pros and Cons: Why (Not) This Car? Audis are an oddity. When Cadillac or Lincoln launches a nose-heavy car based on a front-wheel-drive platform, few auto writers take it seriously. The engine isn't mounted aft of the front axle, and it doesn't primarily (if not exclusively) drive the rear wheels? The car's weight distribution isn't balanced, or close to it? Then BMW and Mercedes-Benz have nothing to fear. well, Audi continues to mount its engines ahead of the axle, where they can drive only the front wheels (though now they often drive all four) and where they imbalance the car. Yet Audis often win both magazine comparison tests and the real competition, that for sales. As I write this, the make has set 59 consecutive monthly sales records. How can this be? The recently updated 2016 Audi A6 midsize sedan provides some clues. I tested both the A6 3.0T and the A7 3.0T (essentially an A6 hatchback) back in 2012, and the A7 3.0 TDI (diesel) in 2014, so this time I requested the four-cylinder 2.0T. (I actually requested the 2.0T back in 2012 as well, but one was not then available.) Can a turbocharged four-cylinder engine deliver the refined performance expected in an upscale sedan? In the other corner, we have a car that checked off all of the car magazine boxes, yet which has not been selling well, the Cadillac CTS. Tasteful styling continues inside the A6. Many other manufacturers copy this look. Why the 2016 Audi A6 / S6? The view from the Audi A6's driver seat dramatically differs from that of its rear-wheel-drive competitors. The instrument panel and center console are lower and more compact, the pillars are thinner, and the windows are taller. The first benefit: better outward visibility, especially forward, but also to the sides and rear. The second benefit of the Audi A6's more open and expansive interior: it feels roomier, especially in the front seats. With no "race car" or "jet fighter" pretensions, the Audi is easier and more relaxing to drive. The BMW, Cadillac, and Mercedes interiors all feel tighter and more confining. Extremely clean body sides. For more drama, spend another $8,000 for the related A7 hatchback. This is what passes for above average usability in a current luxury sedan. Though others have been improving, in part through imitation, Audi remains the industry leader in interior design thanks to a tasteful minimalism. In comparison, Cadillacs and BMWs appear cluttered inside. I haven't rated the relative handling of these cars, as they excel in very different ways. If you're seeking the fancy-brand midsize sedan with the sportiest handling, then head to the nearest Cadillac dealership. But for typical around-town driving, the Audi A6 handles the best. Though I've driven the A6 and A7 in 3.0T form a few times, this was my first experience in the 2.0T. Well, with 100 fewer kilos in its nose, the A6 2.0T feels much more agile, responsive, and light-on-its-feet than I recall the 3.0T feeling, belying a 3,957-pound curb weight. While the A6 3.0T dutifully headed where it was pointed, it couldn't dance the way the 2.0T can. Less weight on the front tires might also contribute to more nuanced and natural-feeling steering feedback than I recall from past A6s, and than you'll receive in competitors. Push the A6 2.0T hard, and it can feel a touch soft and rolly in ways that the more firmly sprung and more tightly damped CTS does not. Take a corner at speed, and the Cadillac leans and plows less. But how often does a largish sedan get driven hard? In typical driving, the A6 2.0T's driving position and handling combine to make it both relaxing and delightful, a difficult combination to pull off. When pushed hard, it lacks the athleticism of the CTS, but remains easily controllable. I was surprised by how much I enjoyed my week with it. The Audi A6's relatively compliant suspension absorbs bumps better than the Cadillac's (and the BMW's as well, if memory serves). You don't sense the weight of the wheels and tires as they rise and fall over uneven pavement. Noise levels also seemed lower than I recall in past Audis, if still not the lowest in the class. Why Not the 2016 Audi A6 / S6? I'm less fond of the A6's exterior than of its interior. The long front overhang required by the forward-mounted engines and the weak rear haunches that are the flipside of the relatively thin rear pillars and tall windows don't lend the car the sportiest proportions or lines. The exterior of the related A7 hatchback is far more enticing. Unfortunately, the A7 isn't offered in 2.0T form and is about $8,000 more when comparing 3.0T to 3.0T. This said, the A6 isn't an unattractive car, and as "why nots" go this is a weak one. Want a second reason that the Audi A6 might not be your best bet? Perhaps its front seats, as these despite a four-way lumbar adjustment (driver only unless you get the 3.0T Prestige) are just okay. Though likely what a German orthopedist recommended--I've sat in these seats for ten hours without any soreness--I'd personally prefer seats that are less firm and more form-fitting. This said, forms differ, and the Audi's might fit yours better than mine. The rear seat is roomy but, like most, is mounted too close to the floor to provide adults with sufficient under-thigh support. With that, I'm pretty much out of why-nots (though I'll touch on a potential one below). A very good all-around car, the Audi A6 has no glaring faults. I didn't like the large uniframe grille a decade ago, but Audi's designers have made it work. Plenty of room in the rear seat, but the cushion is a little low to the floor (a common issue). With a boost from 220 to 252 horsepower for 2016, Audi's turbocharged 2.0-liter four-cylinder engine can accelerate the A6 to 60 mph in about seven seconds, a time that required a V8 not long ago. That said, the 333-horsepower A6 3.0T can do the same in under six. Among non-hybrid gasoline-powered upscale midsize sedans, the front-wheel-drive A6 2.0T has the highest EPA ratings: 24 mpg city, 35 mpg highway. (The BMW 528i scores one mpg lower in both tests.) Opt for "quattro" all-wheel drive, as in the tested car, and the ratings fall to 22/32. Still very good for the class but lower than the BMW 528i xDrive's 22/34. Though improved for 2016, the Cadillac CTS still isn't in the running, scoring 21/31 with RWD and 21/29 with AWD. Want the even better fuel economy of a diesel? Well, at the moment it'll have to be a BMW or Mercedes-Benz. Audi has benched the A6 TDI due to its well-publicized emissions issues. Moving in the other direction, you don't sacrifice much fuel economy with Audi's even stronger engines. The A6 3.0T rates 20/30, while even the 450-horsepower V8-powered S6 manages 18/27--astoundingly good for such a large, ultra-powerful car. In my real-world driving the A6 2.0T quattro's trip computer reported averages as high as 27 mpg in both suburban and highway driving. Make use of the engine's performance potential, and the reported average can fall as low as 18 mpg. All current premium brand midsize sedans have complicated controls. Relative to the touchscreen-based system in the Cadillac, the knob-and-button-operated MMI in the Audi is easier to use. After a few days I usually could perform the necessary operations without looking down at the console. But this isn't the same as being easy to use. Though the A6 2.0T's starting price of $47,125 isn't exactly low, it is the most affordable midsize Audi. Add $2,200 for all-wheel-drive and $3,700 for the Premium Plus Package standard on the 3.0T (navigation, proximity key, blind spot warning, obstacle detection, rearview camera, power steering column adjustments), and it's still $5,300 less than the latter. So how much is the supercharged V6's stronger, more immediate power delivery worth to you? For many buyers of these sedans, probably not $5,300 given that the 2.0T is already quick. The tested car additionally included a $900 Warm Weather Package (4-zone climate control, sun shades) and $800 to upsize the wheels from 18s to 19s, for a total of $54,725. When similarly equipped, the Audi A6 and Cadillac CTS tend to be very close in price, especially after adjusting for any remaining feature differences. A BMW 528i lists for a few thousand more than either. Not a big difference, but a significant one. The value play in the segment comes from a volume brand, Hyundai. The second-generation Genesis lists for about $8,000 less than the Audi. But what do you give up? I'll be comparing the two cars in my next review. I wavered on whether to include reliability among the reasons not to buy an Audi A6, and ultimately did not because the issues here are largely potential ones. As it ages, the 2016 A6 could prove troublesome. The 2012s, after a good first few years, have been requiring more than the average number of repairs lately. But over the past year the 2013, 2014, 2015, and 2016 all have been good. Will this change as they near the end of the 4/50 factory warranty? Perhaps, but this remains to be seen. Or not. In general, recent German cars tend to be good for the first four to six years--the latter the point at which CPO (certified pre-owed) warranties end. I often suggest that there are two smart ways to own a German car: under warranty, or if you're willing and able to perform most repairs yourself. And the Cadillac CTS? We have a limited amount of data on the current car. What we do have suggests that it is more troublesome than the Audi. The Audi A6 isn't the sportiest or best-looking premium-brand midsize sedan. But, given the sluggish sales of the best-handling car in the class, the Cadillac CTS, sporty handling doesn't seem to be a top priority for buyers. Given the priorities of these buyers, which reflect how and where these cars are typically driven, the Audi A6 could be the best of the bunch. Compared to the others, it has a more open interior and easier, more relaxed (yet still precise and disciplined) handling. I found it an unexpectedly enjoyable car to drive around town, where the advantages of a rear-wheel-drive platform are of very limited relevance. And the 2.0T engine? While not as refined or as effortlessly strong as the 3.0T's V6, the four-cylinder still performs very well. For those seeking very good fuel economy (for the class) or simply a relatively low price, it's a fine choice. Plus, while the A6 2.0T might not be the ideal track car, when fitted with the lighter four-cylinder engine the largish sedan feels considerably more agile and responsive--and less nose-heavy--than it does with a V6. As a result, I actually enjoyed driving the A6 2.0T more than I did the A6 3.0T. You might as well. The 2.0-liter turbocharged engine gained 32 horsepower for 2016. Plenty strong, if a bit laggy. It's a trunk. Sadly, the A6 wagon hasn't been offered here since 2011. Audi provided an insured car for a week with a tank of gas. Mitchel Reese of Cadillac of Novi (MI) helpfully provided a CTS for a comparison test drive. He can be reached at 248-476-4466. 2016 Audi A6 / S6 pros and cons, according to Michael Karesh: the best reasons for buying (or not buying) the 2016 Audi A6 / S6. Join TrueDelta to post your own impressions. My DD is a 2013 S6, and when it was in for its most recent recommended maintenance, the loaner provided was a 2016 A6 2.0T quattro, so this review obviously caught my attention. The A6 is an exceptionally well-rounded vehicle, as all modern Audis tend to be. You mentioned "no glaring faults", which while true, seems to me to be damning with faint praise. In daily driving, the 2.0T's handling seemed exactly as I expected - calm, sure-footed and responsive enough to have fun. The slightly laggy power delivery is something that one could get used to, I suppose, but when we're talking $50K plus, compromise isn't a word that should really enter too much into the discussion. The interior continues to set the standard in the segment as you mentioned, being cleaner and more functional than either MB or BMW's designs. In the end, for my money, I'd get the 3.0T, but if better fuel economy is of utmost importance, then I'd get a 3.0TDi when the stop-sale is lifted, as it "goes" nearly as well as the 3.0T while delivering well over 30 mpg combined. Even with the 40/60 split and active differential, Audis still feel nose-heavy when driven very hard. The thing is, as you note there's little if any opportunity to drive them this hard in normal use. Ideally I would have driven the 2.0T back-to-back with the 3.0T, and perhaps a pre-update car as well, to see how much of the difference in steering and handling was due to the lighter the engine, or to any updates to the chassis, or perhaps largely in my head. How did you feel the steering and handling of the 2016 2.0T compared to those of your car? Did it feel lighter and more agile? Or not really much of a difference, or even one in the other direction? I've never driven an S6 or S7. I would argue that understeer is preferable to oversteer for street driving 99.6% of the time. The 0.4% of the time that's left would be when one is attacking a lightly-trafficed and lightly-patrolled backroad. Even then, most drivers would be safer with a car that stays pointed in the direction it's going, rather than trying to swap ends when something unexpected happens. I understand the attraction of neutral handling and even oversteer/sliding - I just don't understand why such behavior, which almost nobody ever experiences on the road, is given such importance when reviewing ROAD cars - even sporty ones. The ride/handling feel of my S6 is quite different than the A6, primarily because of the S6's air suspension. It lends a certain soft edge to the responses, even in its firmest mode. This is by design, as the S6 is the "tweener" in Audi's lineup, its mega-firepower motor notwithstanding. There are RS cars for those who demand ultimate handling and performance. 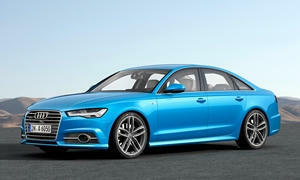 You really should arrange a test-drive of an S6/S7 if you can - they're pretty amazing. That said, they're rare, so maybe you should take your friend up on his offer to drive his - or drive mine if you're ever in the Chicago area! I can't comment on the driving characteristics of the A6, however, as the owner of an S4, I can speak to the driving nature and dynamics of both the supercharged V6 and the nose-heavy architecture of most modern Audi's. In addition, I have driven many iterations of the VAG 2.0T including the Mk VI and Mk VII Golf R and the Mk VII GTI. With respect to the nose-heavy design, I think Michael hits the nail on the head. In daily driving, it is unobtrusive and agreeable. However, as soon as you start to drive with enthusiasm, you can clearly feel the weight over (and beyond) the front axle and the front tires protest at having to do so much work. With the benefit of the sport differential in my S4 (along with the rear-biased AWD), going heavy on the gas will induce some playful oversteer, but again, the front tires pay a huge cost, in accelerated wear, by having to support the weight and steering inputs. I was shocked how fast the front tires on my S4 wore out. I had a MY12 Golf R prior to the R and I have driven both the new R and the GTI. With less measured weight up front, and less overall weight, the Golf certainly feels more agile and tossable. The larger Audi feels more solid and planted. However, all versions of the VAG 2.0T have noticeable lag and non-linear power delivery when compared to the supercharged V6, which has power delivery more akin to a small block Chevy. I found this difference most noticeable when driving with passengers in the car. With the 2.0T, it was more difficult to make gear shifts smoothly in traffic if you suddenly went on boost as you try to keep up with traffic and have to make a gear shift. With the 3.0T, the linear torque delivery makes shifting smoothly while keeping up with traffic effortless. This is not to say that the 2.0T is a bad motor. In fact, it is among the best of the breed, but it will not seamlessly replace something with more cylinders. I gotta say that up until recently, I owned an Audi A5 with the 2.0T and a 6-speed manual transmission and I found the car very well balanced. I think the lighter weight engine makes the car much more balanced than the V8 (and even the more recent supercharged six) found in the S5.The small K03 turbocharger also has almost zero lag, especially compared to other turbo cars that I've owned over the years. I'd even go as far as to say that it's probably the most linear power delivery of any turbo car I've owned in the past (and there's been quite a few of them over the years), due to the extremely flat torque curve. Those engines are pretty much at peak torque somewhere around 1500 RPM and stay at the maximum until the mid-four thousand RPM range, which makes for an extremely flexible little engine. That said, many 2.0T Audis seem more than capable of squirting through traffic with ease, whether around town or on the highway. Now that I think about it, I may just have to get another A5 soon, as it really was a fantastic car overall.